These two bedroom apartments are located in the center of Famagusta, 5 minutes walk to the city center and university. The key delivery for these apartments is scheduled for July 2019. The advantage of buying off plan from this project is that you will be able to select the tiling, build-in wardrobes and kitchen to your taste. Parking places, heating via solar system and much more is available within this project. 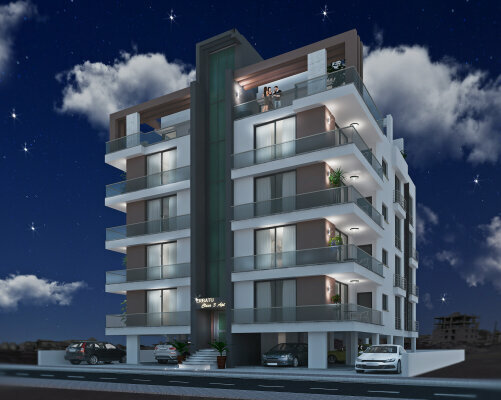 Outstanding, modern apartments in the center of Famagusta - great buy-to-let option. The value of these apartments will continue to increase due to its location. The apartments are located close to the universities and within a walking distance to the city center. The stable increase of the student population will reflect on the demand for the rental property in the region. These penthouses are located on the upper floor of the building and are equipped with a large terrace, where you could enjoy a drink or have Bar-B-Q with your family.